The personal details and emails of society members are hidden to non-members for security and privacy reasons. To view this information, you must Login. The Society is guided by a governing council named the General Committee. The committee comprises a multi-national group of Society members from both government and industry. Below the General Committee are three other committees that focus on key activities within the Society. 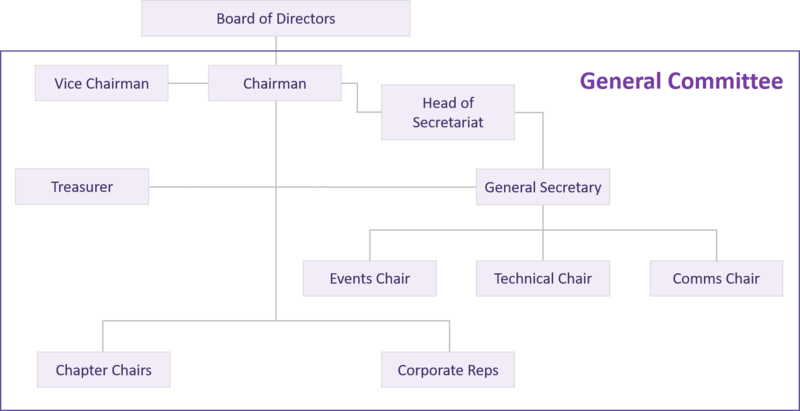 A member from each of these committees sits on the General Committee. Note: For legal reasons, several US Government members are currently unable to hold positions on the committee. However representatives from the US Military are invited to attend the General Committee Meetings. The CAB provides a forum for Corporate Member organisations (within industry, government and academia) to influence the activities that Society undertakes. View the Terms of Reference, here. Chapters of the Society are lead on a volunteer basis by a chairperson. This person is appointed by consensus of members. Contact details are available on the chapter pages.